Summary: The LHCb Collaboration, one of the main four experiments at the LHC, has made the first measurements that confirm that photons emitted in decays of b quarks are highly polarised. This opens the door to a new powerful way to look for physics beyond the Standard Model of Particle Physics. 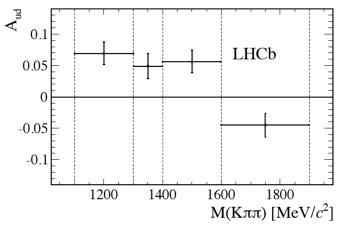 Image: Values obtained for a variable called the up-down asymmetry from fits to the angles of the measured decay products plotted against the mass of the Kππ particle system. The up down asymmetry is proportional to the photon polarisation. It is well known that light can be polarised. This is exploited in numerous technologies, from sunglasses to 3D movies. Now a new measurement from the CERN-based LHCb experiment shows that the polarisation of individual photons of light may shine a path beyond the Standard Model of particle physics. The Standard Model predicts that a b quark can, about once in every 3000 decays, turn into an s quark by emitting a photon. This decay occurs only rarely since it requires a quantum fluctuation where a pair of heavy particles (a top quark and a W boson) appear and then rapidly vanish. The interaction between these particles is such that the emitted photon is expected to be almost 100% polarised. However, since the “virtual” top and W particles are not seen in the detector, they could equally well be replaced by other even heavier particles that are predicted in various theories that go beyond the Standard Model. Such theories have been proposed to address important unresolved questions in particle physics, such as the origin of the imbalance between matter and antimatter seen in the Universe. These models generally predict different values for the photon polarisation, and therefore it is seen as one of the most important measurements that can be made with the latest generation of experiments. The new results have been presented (18 February) at the Lake Louise Winter Institute 2014 and are described in LHCb-PAPER-2014-001, which will shortly be available on arXiv and submitted to Phys. Rev. Lett.